At the time I was getting labels printed I questioned the spelling of this salvia and it was decided that it should be somalensis but now I believe it should be somaliensis, which is more reasonable. Coming from Somalia it is tough! 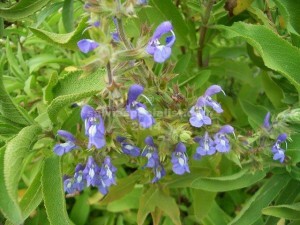 It is a shrub to 2m x 1.5m densely covered with light green leaves and pale blue flowers for many of the cooler months. It makes a good screen or hedge if planted 1.5m apart. Somaliensis sets seed and sometimes self seeds around so it is easy to raise. It is easy enough by cuttings as well. It is frost and drought hardy for most of Australia and survives in Canberra which I always think is a test of cold hardiness. It is flexible in wind.